- Page 9 - Vista Casas Real Estate S.L. 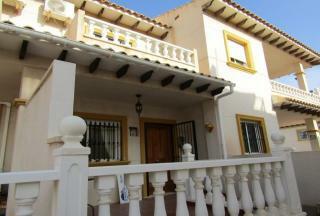 This 2 bedrooms, 2 bathroom Sofia townhouse is located on the popular urbanisation of valencia south. Surrounded by community park and gardens this property has use of a communal pool and is only a short walk from local amenities.. The ground floor comprises a good size sunny front garden with access to a under-build for storage, a front terrace that has been converted into a conservatory, spacious lounge, an American style kitchen with a utility room and direct access to the back garden. 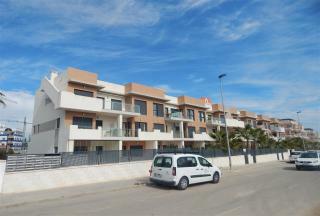 Recently Reduced - South facing 2 bedroom 1 bathroom town house La Zenia beach side. It is set over 2 levels with a large tiled sunny patio area there is a good sized living room and American style kitchen. Part furnished with white goods included. Three Bedroom Townhouse in walking distance to all Cabo Roig amenities ........On the ground floor the property provides a spacious lounge and dining area, leading into a sepeate kitchen which also provides access to the back garden which providing a space for a car, to the front of the house there is terrace with a South East aspect to enjoy the sunshine. Upstairs to the first floor there ia a guest bedroom and the master with a terrace as well as a family batrhroom with bath and shower, up to the top level to the third bedroom with bathroom and access to the another terrace with views of the sea. 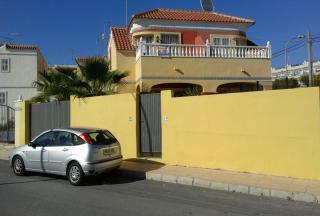 Reduced by 4,500 euro. A beautiful semi-detached Battenburg house on a larger than usual plot. This is the larger 3 bed model house and has been converted to 2 beds and opened up to provide a large living area and modern kitchen with dining area. Sunny orientation, very private walled plot and garden. Communal pool and gardens. These beautiful New Build Apartments are ready for occupancy Now. 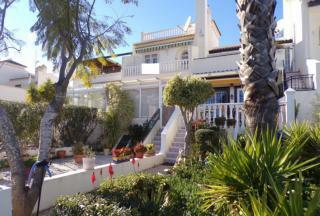 Situated only 800 mtrs to the sandy beach, and only 20 minutes drive from Alicante airport! There is a communal pool and parking. Finance of 70% ready and available. Reduced to sell! 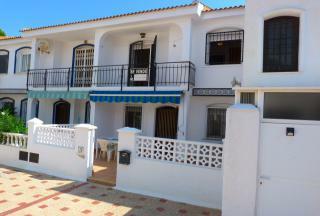 This 2 bedrooms, 2 bathrooms south facing townhouse is located in the popular area of Pau 8, within walking distance of the Villmartin Plaza and Golf Course.The property offers front and back gardens, balcony and roof solarium, while being 100m from the communal pool. Reduced from 149,995! 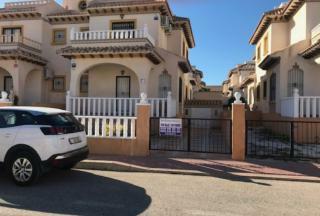 This stunning 1st floor apartment is situated in the up and coming area of Los Dolses. The property benefits from the sun most of the day enabling full use of the terrace, comes with all white goods, all light fittings and all bathroom fitments and substantial storeroom. There is a gym and communal pool on the complex. A must see apartment ideal for permanent or holiday living. 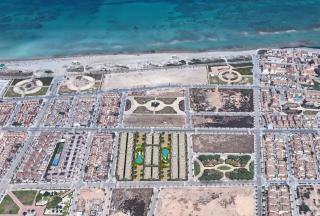 Special Offer on these 1 bedroom, 1 bathroom new build apartments located only 100 mtrs walk to the beautiful beaches. 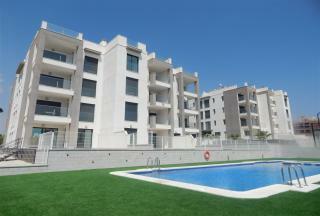 We are offering a choice of apartments with white goods package and air-conditioning included from only 139,900 euro! Situated within a secure, gated community with 2 lovely communal pools and landscaped gardens. This 2 bedrooms, 2 bathrooms quad house has completely been refurbished to a very high standard by the previous owners. Offering an open plan American kitchen with bosch appliances, a large open plan lounge area with doors leading to front and side terraces, shower room downstairs with both bedrooms on the 1st floor sharing a family sized bathroom. Situated close to a new shopping centre while being a short drive to the local beaches. Remaining 8 Available! 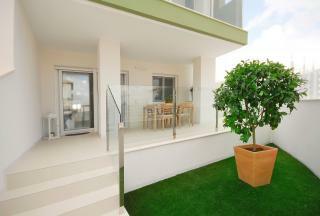 - These high quality 2 bedrooms, 2 bathrooms apartments, with private underground parking space included in the price. 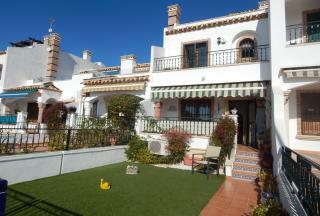 Situated within walking distance of Villamartin Plaza and Golf course. The complex will have communal pools and gardens and padel tennis courts. Ideal location for renting.